As summer fades into fall, it’s time to rediscover those moments that warm us from the inside. An open fire, a cozy knit and a Perfect Storm. We chat to Bar Operations Manager Kris Jensen about the inspiration behind this season’s winter warmer cocktail. What was the inspiration behind the Perfect Storm? The Perfect Storm is our riff on a classic Dark ‘n’ Stormy cocktail. The Dark ‘n’ Stormy originates in Bermuda where the island was producing both dark rum and ginger beer at the same time. Being such a small island, the two inevitably wound up in the same glass and became a national cocktail. A WWI sailor is said to have coined the drink’s name when he described its colour as “a cloud only a fool or a dead man would sail under.” We decided to take a legendary cocktail and put our own spin on it and thus dubbed our creation, the Perfect Storm. Can you tell us something special about this cocktail? We use a black spiced rum called The Kraken, which is named after a mythical sea creature rumored to have sunk a ship carrying rum out of the Caribbean. Whether it was a mythical sea beast or a perfect storm that sunk the ship, we will never know. We chose the Kraken for this cocktail because of its rich spice aromas and dark chocolate, vanilla bean complexity. It is an ideal match to pair with falernum. Now you mention it, what is falernum? Falernum is a rum based syrup that is made of cloves, allspice, ginger, lime, vanilla and almonds. 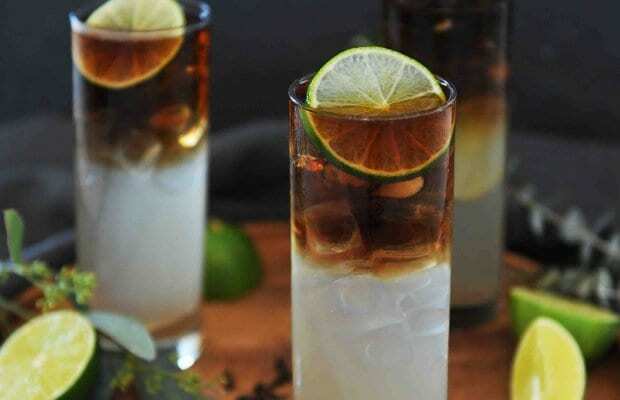 It is a syrup that is synonymous with tiki-based cocktails, but it works perfectly in this drink to amplify the spicy notes in the rum and ginger beer. Why is a Perfect Storm the perfect fall cocktail? The name itself connotes the stormy season that we all know is imminent on the horizon, but it is the flavour profile that really ruminates with fall. The drink itself is extremely refreshing while the spices in the falernum warms you from the inside and will remind you of grandma’s baking. What’s the ideal match for this cocktail? The Perfect Storm is the kind of cocktail that will go with just about anything. It is well balanced and the ginger will help cleanse the palate with whatever you decide to eat. My favorite match with this drink though is the Pumpkin Cheesecake. These two items have many mutual flavor components and seem to only make each other better. And lastly…What’s your favourite place to visit in the fall? My favorite place to visit in the fall is Tofino and Ucluelet, they are the kind of places you can enjoy equally whether it is bright and sunny or pouring with rain. In fact, it almost seems to make more sense when its dreary and windy out as you can witness the elements that shaped the gnarled trees and extreme shoreline. Take it all in while sitting comfortably inside sipping on a Perfect Storm. Try the Perfect Storm at a Cactus Club Cafe location near you.